For this week's home edit I've gone for playful pastels, and pretty feminine touches for your home. I'm itching to start showing you some gorgeous Autumn tones so definitely stay tuned for that over the next few months. 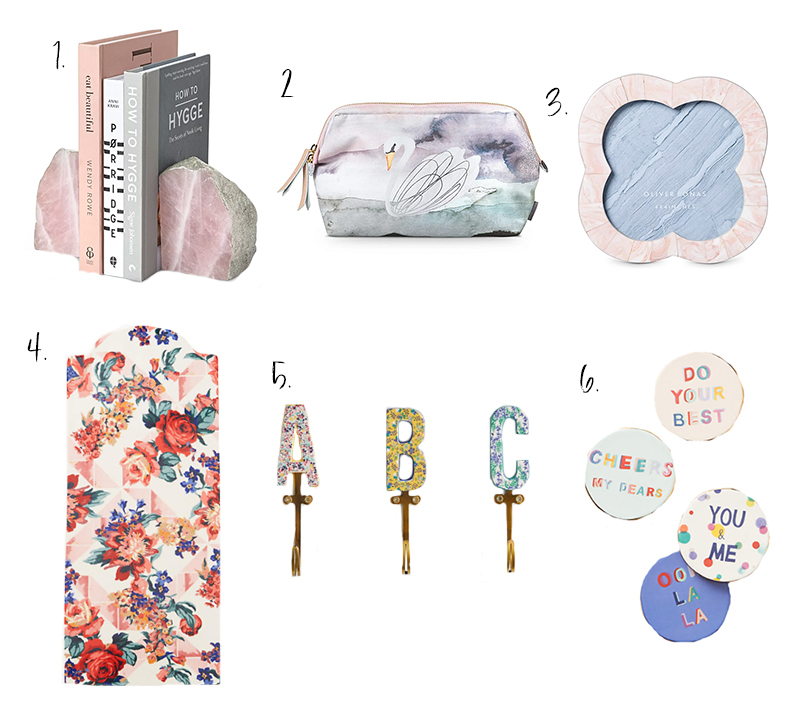 Picks are from Anthropologie and Oliver Bonas. 1) Rose Quartz Book Ends £60.00 [x] : You can't get anymore luxe than these beautiful rose quartz book ends that are cast in gold and glitter each with a unique shape. This is decadence for the modern girl. 2) Swan Silver Foil Wash Bag £25.00 [x] : After getting the most beautiful swan print top in the Asos sale I have definitely gone a bit swan crazy. So obviously I am a little head over heels for this gorgeous Oliver Bonas wash bag. My favourite part is the cute message inside: "You are a whole lot of lovely." 4) Liberty for Anthropologie Geo Paradise Garden Cheeseboard £58.00 [x] : Add this to the list of things I'd have in my dream house but really can't afford. Also can we just talk about how beautiful the Liberty for Anthroplogie collection is? Dying here at how much I want everything. 5) Liberty for Anthropologie Monogram Hook £16.00 [x] : Who doesn't love something monogrammed? I really want to pick up one of their V hooks to put on the back of my bedroom door! 6) Caption Coaster £8.00 [x] : Oh I do love a good coaster... And aren't these ones just so fun? Guaranteed to bring a few more smiles into your home. The book ends are such a cool idea! cant help but sing ABC in my head when I saw those hooks haha love them!